My mother came from Jarrow. She was the youngest of nine surviving children. 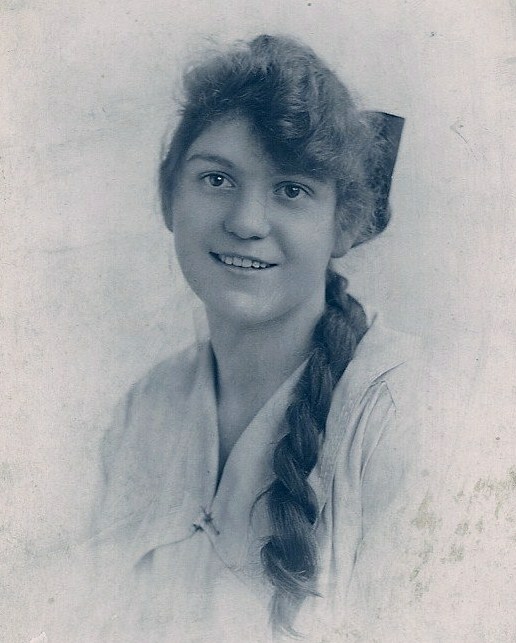 Born in 1903, she was given the name of a sibling who had been born c.1890 and died as a baby. Barbara was a family name going back some time. Her father, John Samuel Bucknall, owned a butcher’s shop and, in a residential part of town, a house. 108 York Street was bought on a long-term lease. The houses were terraced with bay windows up and down. A small garden, iron railed and gated, formed a buffer against the street. The garden boasted a privet hedge, purple irises and a bush of southernwood, the leaves of which Barbara’s mother, Ann, loved to crush between her fingers in order to inhale the aromatic fragrance. During the dark hours the night soil men would work their way along the lane emptying the earth closets that abutted on to the lane from each back yard. On fine days the women would lean over the back yard gates and gossip, whilst keeping an eye on their offspring playing in the dust. A favourite game of the little girls was one, which they called ‘boody’. They would dig in the front gardens if allowed or on the verges of the lane and search for broken shards of pottery and glass that they would hoard jealously, vying with one another as to who had collected the most. The front street itself was popular for playing hopscotch, a game that required a smooth surface. It was popular too on dark winter evenings when the lamplighter had been round with his taper and the gaslight shed a pool of brilliance round the metal lampposts. Then the children would cluster round exchanging confidences and swinging from ropes that they threw up and over the ‘arms’ that stuck out from beneath the glass lampshades. John had been born in Wolverhampton, Staffordshire. Why he moved north I do not know. Neither do I know how he came by sufficient money to enable him to buy a lockup shop with a slaughter yard attached. The type of house in York Street, to which they moved from Albert Street, was not in every one’s grasp in those days of poverty. John was of average height and build with sandy coloured hair and a quiet disposition. He married Ann Parker Watson when she was nineteen years of age, Ann died before I was born so I have only seen her in photographs. They show a plump well-corseted figure with neat white wavy hair, a round even-featured face and beautiful brown eyes. She was born in 1858 in South Shields. Her father was a rigger. John and Ann had several children. The eldest, James, emigrated to Chicago. Jane (Jinny), Nellie, Annie, Ruth, John, Leah and George all figured in mother’s stories. She herself was the youngest, younger, in fact than her sister, Jinny’s, two daughters to whom she was an aunt. Ann Bucknall could neither read nor write. Born before schooling became compulsory she had no formal education. Whether because her parents could not afford the coppers each week or whether they thought education unnecessary for a girl is a matter for conjecture. She was ashamed of the fact that she was illiterate and concealed it wherever possible. Sometimes she would pick up a newspaper and pretend to read it, on occasions whilst holding it upside down. She signed her name with a cross in lieu of a signature. Although she could not read she could knit jerseys and stockings without the help of a pattern. John travelled regularly to Newcastle cattle market. After purchasing the chosen beasts he would walk them back home to Jarrow. Wooden gates, high and heavy, concealed the slaughter yard from view, but gruesome-minded children would dare one another to peep through the gap between gate and road and look at the blood. I always found it hard to believe that my gentle mother took part in such activities but she assured me that she did. At some time around the turn of the century John invested some savings in the Eldorado Silver Mine Company. Supposedly in South America the mine was non-existent and he lost his money, as did thousands of other gullible investors. Apparently there was a surfeit of such frauds at that time. Jarrow was a depressed town and had more than its share of desperate poverty. John not only allowed his customers ‘tick’ he would also send some of the more needy people to his home. ‘Take a basin and Mrs Bucknall will give you some broth’, he would say. After he died in 1909 Ann burnt all the ‘tick’ books. ‘They couldn’t pay then, they certainly can’t pay now’. She said. Leah and George, being close together in age, were partners in many things. For instance, it was their job, each evening, to clean their father’s boots. Knee-high black leather soaked in blood and clotted with sawdust, they had a boot apiece to clean and polish ready for the next morning. As well as chores for the children to do there was mischief to get into. Once, when Leah and George were very young they decided to have an adventure. They would go to South Shields, some three miles away, early the next morning and have a whole day at the seaside. They lit a candle and stood it beside the clock on the chest of drawers so that they would be able to see the time when they awoke. The children were awakened before daybreak the next day by the smell of charred wood. The room was full of smoke, the candle nothing but a congealed mess on the ruined surface of the chest. They rummaged in a drawer and found a cloth runner to cover the damage, bundled the burnt clock into the drawer and crept down the stairs. Sneaking out of the back door and down the lane they pushed all thought of retribution out of their minds as they set out on the long walk to South Shields. Leah seems to have had a taste for ‘adventures’. She once travelled with her mother on a steamer carrying coal from Newcastle to London in order to visit her Aunt Barbara. George’s adventurous traits led him to join the army in 1914 whilst still under age. He served in the notorious trenches in France where he was gassed. In later life in consequence of the gassing he lost his sight completely. By that time he was a Master Baker with his own thriving business in Murton, County Durham. In spite of his disability he continued to work doing everything he had done previously. The main rule being that everything had to be kept in its proper place so that it was easily to hand. One day during the First World War some Military Policemen knocked at the door of 108 York Street. A nephew of Ann’s who lived in South Shields had failed to return to his regiment at the end of his leave. His cousin, George, when he came home on leave himself, said, ‘I can’t blame him’. Whether he was ever traced and what was the outcome I do not know. Airedale. The house on Fryston Road was next to the one where my father lived. That is how my parents came to meet. Customs that have long since died out still lingered in those days. The anniversary of Queen Victoria’s birthday, 14th May, was known as Empire Day and celebrated each year. Patriotic songs were sung and flags flown. On May Day a beribboned Maypole formed the focal point of the activities and one memorable year Barbara Bucknall was the little girl chosen to be May Queen at her school. On Easter Sunday the children took their coloured hardboiled eggs to the park and rolled them down the hill. ‘Carling, Palm, Paste Egg!’ the children would chant on the days preceding Easter. Carling Sunday is the fifth Sunday in Lent, a week later than Mothering Sunday. The custom in the North-East of England is to eat carlings that are soaked overnight, boiled, and then fried in butter. Served with vinegar the tasteless little peas gain some flavour! According to tradition, there was a famine in Newcastle and a ship docked laden with carlings. These little peas saved the community from death. Willow, hazel and yew were some of the green branches gathered in the few days preceding Palm Sunday for decoration. ‘Paste’ was a corruption of Pasch or Paschal – from the Hebrew word meaning Passover. Eggs were coloured by boiling in water with onionskins or painting with cochineal. Barbara was a thin frail child prone to fainting fits. In fact she had a congenital hole in the heart that wasn’t discovered until much later in her life. Her hair was a rich brown colour and swung down her back in long plaits. She had large brown eyes and a pale complexion. The school that she attended was requisitioned for use by the army and the pupils were sent to another school further away. Because this doubled the number of pupils the space had to be shared and the children went to school for half a day, five days a week. Barbara wasn’t very keen on school but she plodded on. One lesson that she dreaded, one that she should have enjoyed, was knitting. The project was the knitting of long black stockings. The problem was the four steel needles used to make them. Barbara’s hands sweated with the effort of knitting, the wool became damp, and after a week in the schoolroom cupboard the steel needles had rusted. It took almost the whole of the next lesson pushing the stitches slowly along the roughened needles before the rust rubbed off and then the yarn moved smoothly. By that time the lesson was almost over and the work had to be stowed away in the cupboard again. Barbara never managed to finish one stocking let alone the pair. At the end of the school year she took them home and her mother completed the job. Sometimes Barbara’s sister Jinny would send her to the local public house with an empty jug. Waiting for it to be filled inside the door marked ‘Jug and Bottle’, she would hope that no teacher from her school would see her and think that she came from a ‘boozy’ family. Other errands included visits to the local shop for a ‘pennorth of pot stuff’ – turnips, leeks, carrots etc., or ‘a pair of corsets with cups in’. The usual employment for girls in those days was ‘service’, and Barbara’s sisters went, each in turn as they left school, away from home to work in big houses. Long hours of hard work with little pay at the end of it. Sleeping in tiny attic rooms, frozen in winter and stifling in summer, they quickly learnt their place in the rigid hierarchy of the Servants’ Hall. ‘We had to rub hard at the rust on the steel fireplaces in the bedrooms’, Leah told me years later. ‘Every day the damp caused more rusty patches to form but they had to shine like mirrors before the Housekeeper was satisfied’. There was primitive plumbing at best in some of those grand houses. ‘No bathrooms’, said Leah, when she told me about one house she worked at. ‘Each morning we had to carry container after container full of hot water up the stairs to fill the baths which stood in each bedroom’. Later the water had to be ladled out of the baths and carried back downstairs. ‘Sometimes we could tell that the water hadn’t been used at all. They would jump out of bed at the last minute to go downstairs for breakfast I expect’. Used or unused, the empty copper bathtubs had to be dried and polished to a burnished finish. Game was hung in the cellars until the bodies parted company from the heads and lay on the floor beneath the supporting wire waiting to be collected by the scullery maid. One of her jobs was to pluck and clean the maggoty carcasses. In one house the Mistress insisted that the cook baked the bread outside in a Dutch oven. The resulting loaves were never baked quite sufficiently and used plates were invariably carried out of the dining room with a frieze of pallid pellets adorning the rims. Barbara was once invited to visit her Aunt Barbara in London. It was a great adventure for a twelve year old who had never travelled very far on her own before. Her Uncle Bert was waiting for her when she arrived at King’s Cross Station and escorted her down into the underground rail system on the last leg of the journey to Marble Arch. From there they walked along Park Lane to their destination. Aunt Barbara and Uncle Bert Love lived in a tall house facing the park. The property belonged to a wealthy landlord and was part of the estate of the Duke of Westminster. The house was not far from where the Grosvenor House Hotel now stands. It consisted of rooms that were let to gentlemen, some of whom only used it as a postal address, but the rooms had to be ready for use at all times. Hard work and ruthless ambition had carried Bert and Barbara up the ladder of the servants’ hierarchy to this plum position. They moved to Park Lane during the reign of Edward VII when horses were the power that drew vehicles through the streets, carts, carriages and two wheeled hansom cabs. This was the era of the Suffragettes; women wore long skirts and the incandescent mantles of the gaslights illuminated big hats, elegance and poverty. They ran their establishment with dedicated efficiency, providing meals and comfortable accommodation. The staff consisted of a cook, butler, and two maids. They preferred to recruit the maids from the poorest part of the East End because girls from there would be content with less, and more overawed by her. Two maids, sisters, said they preferred vegetable water poured onto their dinner instead of gravy, because that was what they were used to, but did like to use lots of salt and pepper. Aunt Barbara kept such condiments safely locked away. Uncle Bert was Master of one of the London Lodges of the Freemasons. In an old photograph he appears tall, of military bearing and impressive figure decked out in all his Masonic regalia. Aunt Barbara was small and dark. She was not renowned in the family for generosity, although she had two thousand pounds worth of jewellery in the bank, or so the story ran. Several steps led up to the front door of the house and across the street Hyde Park, with its famous Rotten Row,1 where for centuries the favoured and fashionable had taken the air in their carriages and ridden their horses. Later, the child would watch through the windows as the thoroughbred horses trotted along the grass denuded track, early morning mists swirling around their hooves. Barbara’s aunt treated her kindly and Uncle Bert escorted her round London taking her to see all the places of special interest. It was just as well that he was willing to show her round, as apart from the fact that she was so young the total amount of her spending money was two shillings. A large amount to her but which, when revealed to her aunt provoked loud laughter. However, her money was soon spent because at every historic building they visited he would tell her to buy postcards and leaflets. When Aunt Barbara and Uncle Bert retired they bought a newly built house in Acton, West London. Having now a great deal of leisure time they decided to visit Aunt Barbara’s nephew in Chicago. Chicago during the prohibition period, when manufacture, sale and transportation of intoxicating liquor was banned from 1920 – 1933. Where bootlegging was rife and Al Capone was uncrowned king of the underworld. Jim, Ann’s eldest son, had emigrated to America with his wife, Jane, and two children, Mark and Eileen. He had a good job and was able to live comfortably, although perhaps not in Aunt Barbara’s league so far as finances went. On arrival in Chicago Uncle Bert hired a car and they spent a great deal of time visiting places of interest in the area. One evening, after a day out, they were relaxing with Jim and Jane when Mark, then a teenager, burst into the house. Ashen faced and breathless he flew upstairs closely followed by some policemen. Unknown to his uncle he had taken the car and held up at gunpoint an approaching vehicle. This turned out to be full of policemen. From this you may deduce that not only has our family got its share of ‘skeletons’, some of them have been ‘thick’! Mark was sentenced to deportation. 1 Rotten Row is a corruption of Route de Roi. It was the chosen exercise area for Royalty.